Turning business and technical requirements in to documentation that provide a complete picture of how the UI will behave and look. I joined the Brand Marketing Technology (BMT) team in December of 2015, about a year in to a project to overhaul their existing content management tool, called BNX. There were some challenges up front as the team had little experience in the nuts and bolts of how you turn these big ideas in to something concrete that could be handed off to a development team to implement. One of my first tasks what getting the team to adopt using Axure as our main tool for working on and delivering UI specifications. This allowed us to collaborate better and to hand over documentation that was consistent across the board. Another challenge was that we had limited access to the end users of the existing tool due to the sensitive nature of the work each marketing team performs and our own team's risk of having users see the new tool before we rolled it out. Fortunately, we could rely on members of our team, whose roles were to train users how to use the existing tool, to provide us insight in to the various workflows and how users expected the tool to behave. My day to day responsibilities included working with the project leads (project manager, manager, director) to help define UI requirements based on the user stories from upcoming releases. I then worked in Axure to create flow diagrams, wireframes, and working prototypes (when needed) to present and receive feedback. Soon after I joined the team I created a visual style guide which I was able to take in to Axure to create a library of finished looking widgets that could be used to quickly create polished looking wireframes. This allowed the project leadership to make quick decisions and was vital to us being able to deliver a fully redesigned experience by our first release date. 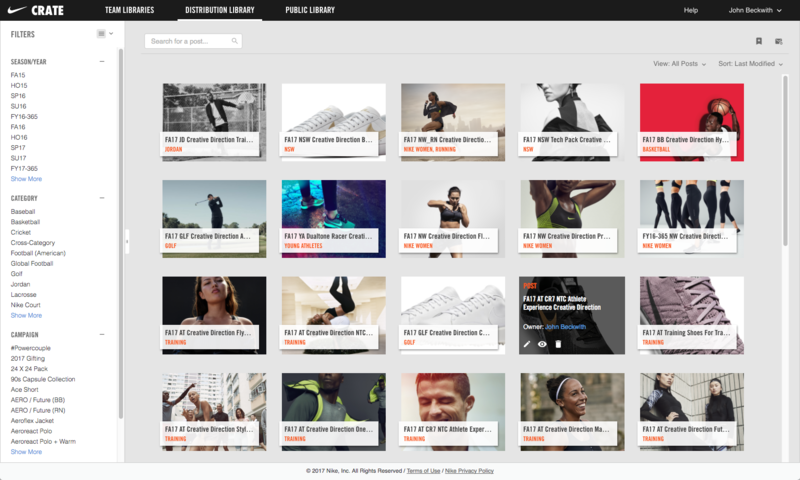 Crate is a digital asset management and content publishing tool used by thousands of users in Nike's Global Brand Management organization as well as countless agencies that partner with Nike. It is an integral part of Nike's marketing campaign workflow. 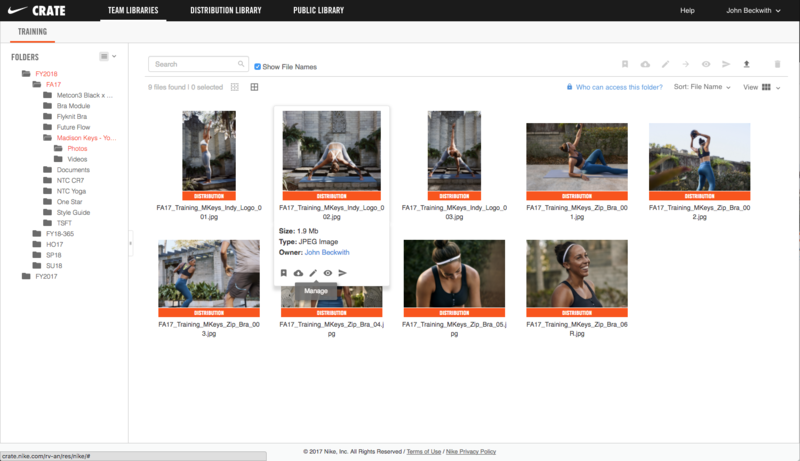 Above: The default landing page for users is the Team Libraries page. 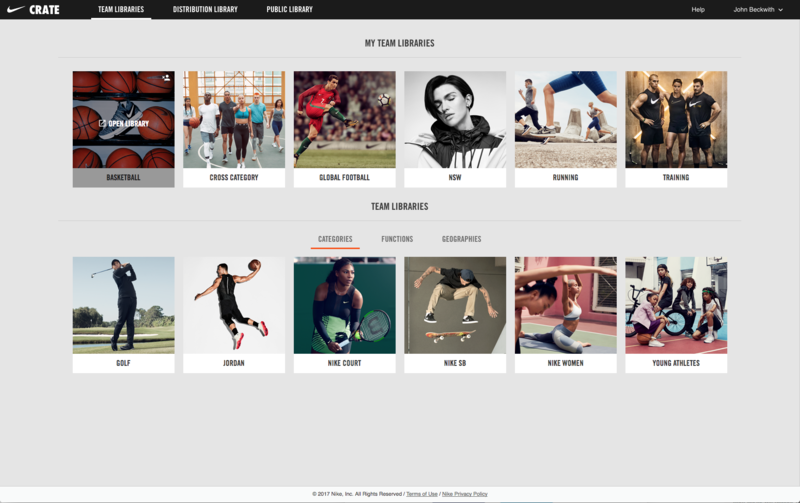 Team Libraries are spaces where individual teams within Nike GBM (i.e. Basketball, Global Football) upload and manage media assets that will eventually be used in Nike's marketing campaigns. Here, users can see what Team Libraries they have access to, and can request access to join ones that they don't. The goal with this page was to provide users with a very clean initial experience, so the actions were hidden behind a hover state initiated by the user hovering the cursor over a Team Library's cover photo. Above: When users are ready to share out more details about marketing campaigns they create "Posts" which appear in the Distribution Library. Here, other users that are collaborating across teams can view the progress of each campaign and edit the post to add descriptions or more assets. Users can browse through the posts, sort via a dropdown menu, or find posts by filtering. The layout and visual design of the Distritbution Library was meant to be simple to let the compelling imagery in the Post cover photos to "pop" off of the page. Above: This is a detail view of a Post after the user has clicked on one from the Distribution Library. 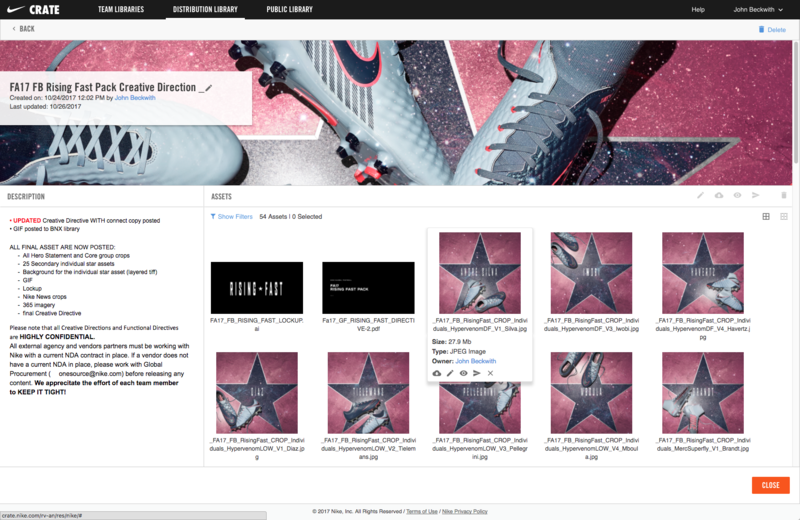 Again, the layout and visual design serve the amazing athlete and product photography while not getting in the way of the functionality and information being displayed. Here, a user can view the description of the campaign and view the assets selected by the marketing team to be used in the campaign. Certain users are also able to edit the Post, adding to the description or attaching more assets. Above: View of a Team Library after user has clicked to access on from the Team Libraries landing page. Every Team Library contains the same top level folder structure, based on Fiscal Year and Season/Year used throughout Nike GBM, so every asset is tagged with that information by default. Users can create custom folders within that structure where they can upload and manage assets. There is also heavy permission functionality that allows users to control access and visibility within their team. Above: An example of how users can manage details about assets in their Team Library. A user can manage things like tags, contract information, permissions, and asset ownership.